There seems to be an endless variety of wildlife in the Pacific Northwest. This Tufted Puffin is a polite bird that belongs to the Auk avian family and is found along coastal waterways. Often referred to as the “Parrot of the Seas”, its curved orange beak, bright orange webbed feet and distinctive white tufts of feathers add to its charm. Join us in creating this wonderful bird!! 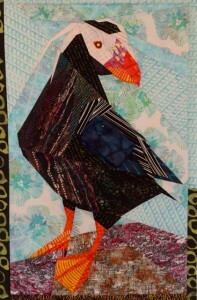 Pattern: Purchase the Tufted Puffin pattern available for this class. Patterns will be available for purchase prior to class. Fabrics: You will see that my patterns combine a wide selection of fabrics that enhance the look of the quilt. The image (such as a chicken, flower or bird) will use anywhere from 6-15 different fabrics, mostly in small pieces. Some fabrics will be repeated in the quilt, others may appear only once. The backgrounds will also typically feature 3-6 different fabrics that have a similar look. In some instances we will be looking for specific features in a patterned fabric — for example something that suggests the shape of an eye, or feathers, or fur or a stem. Patterned fabrics with multiple colors add texture and dimension to the quilt. We will be playing with different combinations to see how these fabrics look next to each other. Having lots of patterned fabric choices from which to choose is part of the creative process for these quilts and helps bring these designs to life. It’s the seemingly odd combinations of fabrics that bring texture and depth to your quilts, and will work well. If you have a small digital pocket camera, bring it! Using the camera on your phone or tablet will work as well to audition fabric selections.